LONDON: Massive Crowds Turn Out To Protest Trump - Joe.My.God. 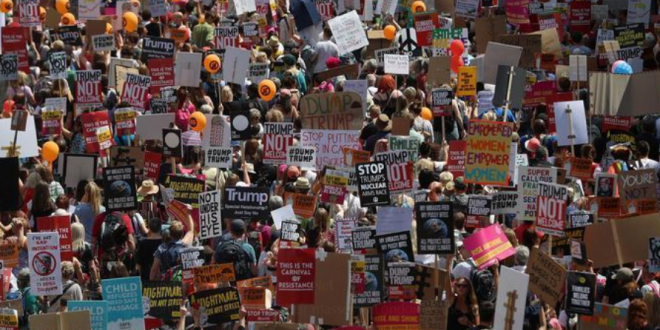 Protesters have begun gathering in the UK for demonstrations against Donald Trump and his controversial policies, as the US President stayed out of central London, where the biggest rallies are expected. The leader’s schedule has been organized for him to avoid the protests, and although Trump claims he is very popular in Britain, he conceded the planned demonstrations made him feel “unwelcome” in the capital, in an interview with The Sun. At 11 a.m., protesters began gathering outside the BBC in central London’s Portland Place for a separate demonstration branded “Bring the Noise,” led by the Women’s March London, which organized mass demonstrations in 2017 against Trump’s remarks and behavior toward women.